New Clock May End Time As We Know It Scientists working to create the perfect atomic clock have a fundamental problem: Right now, on the ceiling, time is passing just a bit faster than it is on the floor. Strontium atoms floating in the center of this photo are the heart of the world's most precise clock. The clock is so exact that it can detect tiny shifts in the flow of time itself. To him, days, hours, minutes and seconds are a way for humanity to "put some order in this very fascinating and complex universe around us." We bring that order using clocks, and O'Brian oversees America's master clock. 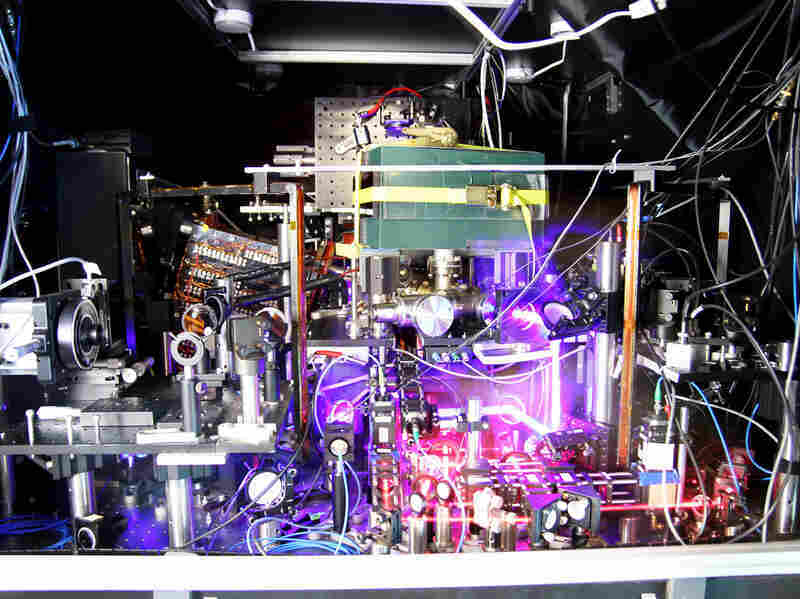 It's one of the most accurate clocks on the planet: an atomic clock that uses oscillations in the element cesium to count out 0.0000000000000001 second at a time. If the clock had been started 300 million years ago, before the age of dinosaurs began, it would still be keeping time — down to the second. But the crazy thing is, despite knowing the time better than almost anyone on Earth, O'Brian can't explain time. "We can measure time much better than the weight of something or an electrical current," he says, "but what time really is, is a question that I can't answer for you." Maybe its because we don't understand time, that we keep trying to measure it more accurately. But that desire to pin down the elusive ticking of the clock may soon be the undoing of time as we know it: The next generation of clocks will not tell time in a way that most people understand. At the nearby University of Colorado Boulder is a clock even more precise than the one O'Brian watches over. The basement lab that holds it is pure chaos: Wires hang from the ceilings and sprawl across lab tables. Binder clips keep the lines bunched together. In fact, this knot of wires and lasers actually is the clock. It's spread out on a giant table, parts of it wrapped in what appears to be tinfoil. Tinfoil? 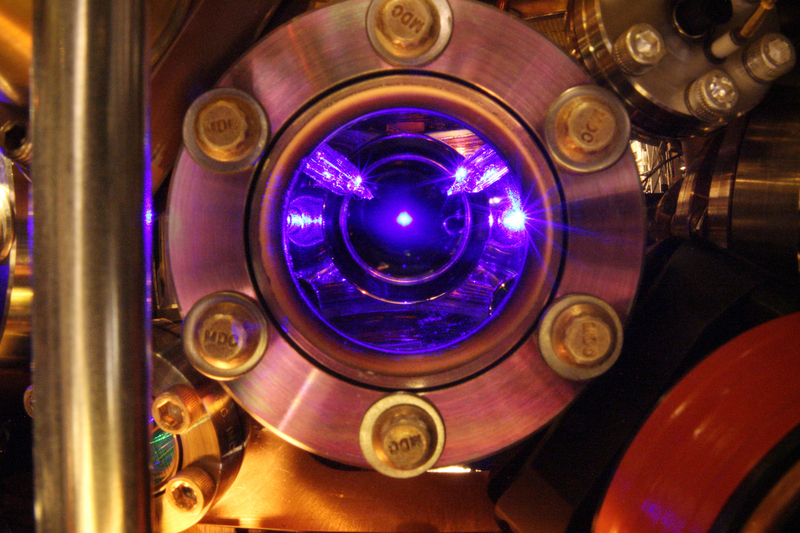 At the heart of this new clock is the element strontium. Inside a small chamber, the strontium atoms are suspended in a lattice of crisscrossing laser beams. Researchers then give them a little ping, like ringing a bell. The strontium vibrates at an incredibly fast frequency. It's a natural atomic metronome ticking out teeny, teeny fractions of a second. 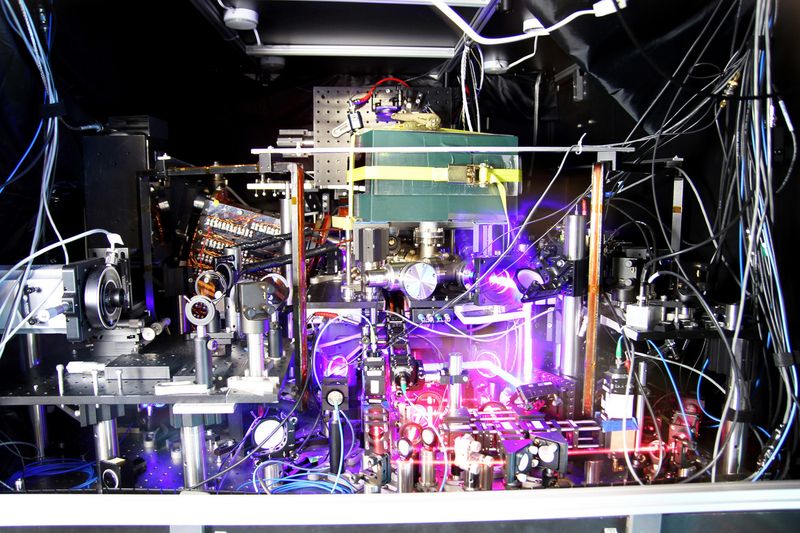 The world's most precise atomic clock is a mess to look at. But it can tick for billions of years without losing a second. That's a problem, because to actually use time, you need different clocks to agree on the time. Think about it: If I say, 'let's meet at 3:30,' we use our watches. But imagine a world in which your watch starts to tick faster, because you're working on the floor above me. Your 3:30 happens earlier than mine, and we miss our appointment. This clock works like that. Tiny shifts in the earth's crust can throw it off, even when it's sitting still. Even if two of them are synchronized, their different rates of ticking mean they will soon be out of synch. They will never agree. The world's current time is coordinated between atomic clocks all over the planet. But that can't happen with the new one. But the NIST's chief timekeeper, Tom O'Brian, isn't worried about all this. As confusing as these clocks are, they're going to be really useful. "Scientists can make these clocks into exquisite devices for sensing a whole bunch of different things," O'Brian says. Their extraordinary sensitivity to gravity might allow them to map the interior of the earth, or help scientists find water and other resources underground. A network of clocks in space might be used to detect gravitational waves from black holes and exploding stars. They could change our view of the universe. They just may not be able to tell us the time.